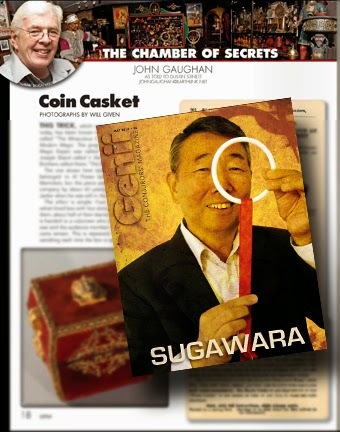 One of my favorite columns in the Genii Magazine is called The Chamber of Secrets by John Gaughan. Every month, John shares with the readers a piece of magic apparatus from his collection. In the May 2014 of Genii, he shares the Coin Casket. Back in June of 2012, I wrote a piece on the Coin Casket as well. My column included some video. 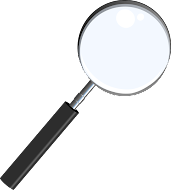 I would encourage you to check out John's column because he gives a lot more historical details than my column did. But then check out my column also because I've included video so you can see the Miraculous Coin Casket in action! While I'm at it, there is another historical column that doesn't appear every month, but when it does show up it's always a treasure. That column is called Memoirs of a Magic Dealer by Al Cohen. Al's Magic Shop was the shop I grew up going to. And Al Cohen was the coolest guy ever to demo magic tricks. He was always so captivating and entertaining and mainly because he was just being himself! Check out his column, great stuff! While I'm at it I also need to mention three other columns that are not magic history but always superb. 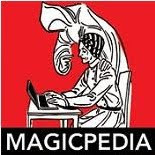 Jim Steinmeyer's column called CONJURING, Tom Stone's column called Lodestones and finally a new column by Jonathan Pendragon called Panmagium. Conjuring has been missing of late, probably due to Mr. Steinmeyer's schedule. But Tom Stone's column is a bit Steinmeyer-esque this month and worth checking out. And Jonathan's column is nothing short of brilliant. So please, by all means go check them out. And I'll be doing a similar thing with MAGIC Magazine soon, pointing out the historical columns! In the mean time, enjoy.